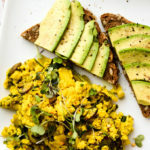 These vegan scrambled eggs actually scramble thanks to secret ingredient aquafaba (i.e., chickpea brine). They’re made with a combination of firm tofu, aquafaba, olive oil, nutritional yeast, kala namak (for an egg-like sulfuric taste), ground turmeric (for color), and freshly ground black pepper. 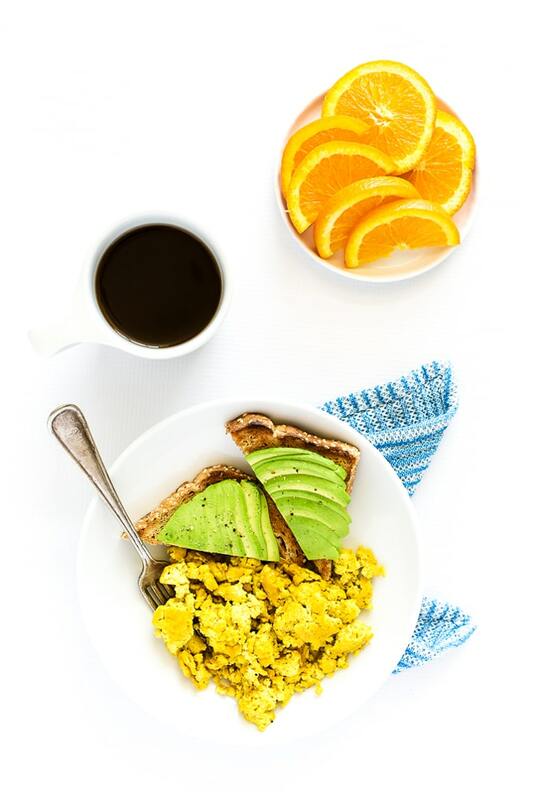 All ingredients get blended until smooth and then scrambled in a skillet just like traditional scrambled eggs. Serve them alongside avocado toast and orange slices for the perfect vegan brunch! There have been next to zero animal-based products I’ve missed since transitioning to a fully plant-based diet two years ago. And by “next to zero,” I mean only one. So what’s the one thing I do miss? Cheese? Nope. Surprisingly, not at all. Meat? Nah, lost my hankering for the stuff when I went vegetarian. Eggs? Ding, ding, ding! You betcha. Especially scrambled eggs. 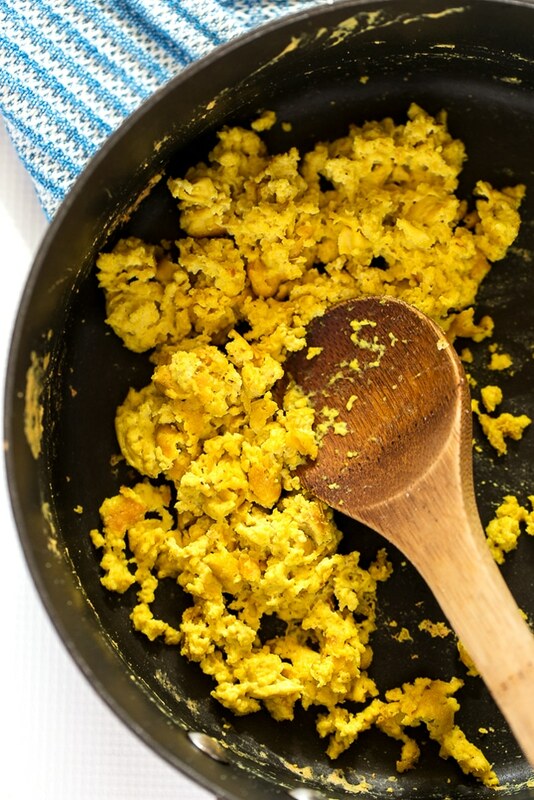 The traditional “tofu scramble” has partially filled the scrambled egg void, but crumbling tofu into a pan just isn’t the same as skimming soft, fluffy egg curds off a hot skillet. It’s that magical moment of seeing the egg mixture transform from goopy liquid to fluffy scrambled eggs that gets me. Gah, what’s a gal to do? Well I about fell out of my office chair a few months ago when I spotted a certain pre-made vegan scrambled “egg” mixture online. I ordered it immediately and couldn’t wait to try it. Perhaps my expectations were too high, but the texture just wasn’t the same. Not even close. Dense and rubbery. To be fair, I only gave it one chance and haven’t gone back to it since; thus, I’ll offer that kind, compassionate brand the benefit of the doubt and consider the possibility that the unsavory texture might have resulted from my own cooking error. 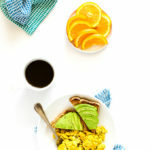 But the whole experience got me thinking that maybe, just maybe there was a way to recreate a vegan version of scrambled “eggs” that actually scrambled and had a taste + texture highly reminiscent of the “real” thing. Correction: it was worth 10 shots. For the record, in this scenario “shots” = recipe-testing attempts. Get your mind outta the gutter college fraternity party (and give mine a hand while you’re at it, will you). Where were we? Ahh yes, 10 shots. I’ve been testing different variations of this recipe since early May and finally stumbled (or should I say scrambled) upon a winner just the other week. Throughout testing, I tried versions with a base of chickpea/garbanzo flour, silken tofu, firm tofu, and/or aquafaba (or any combination of the four). However, the winning version relies on a simple base of firm tofu and aquafaba. Here’s the full list of ingredients. . .
Kala namak (i.e., black salt with an egg-like sulfuric taste). Freshly ground black pepper (if you desire). 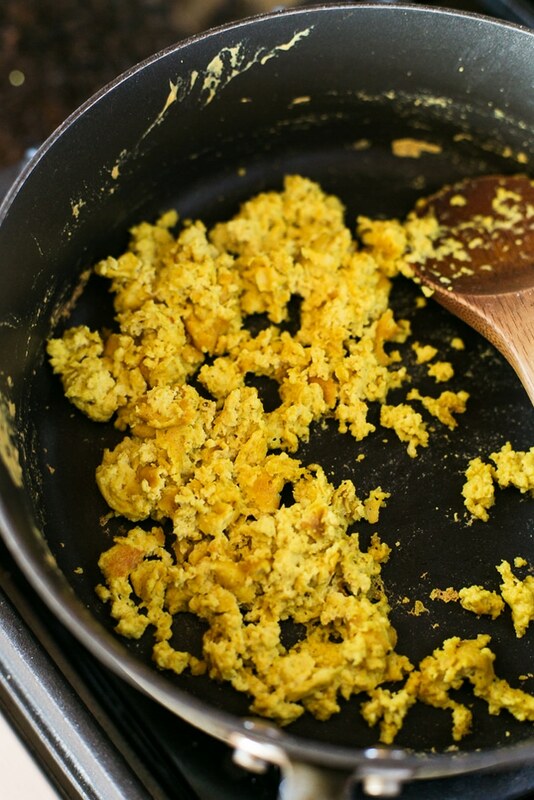 To make these vegan scrambled “eggs”, you’ll blend together all the ingredients like so. . .
Then, you’ll cook the tofu-aquafaba mixture in a hot pan for 10–15 minutes, skimming and scrambling as you go, or until it looks like this and/or this. 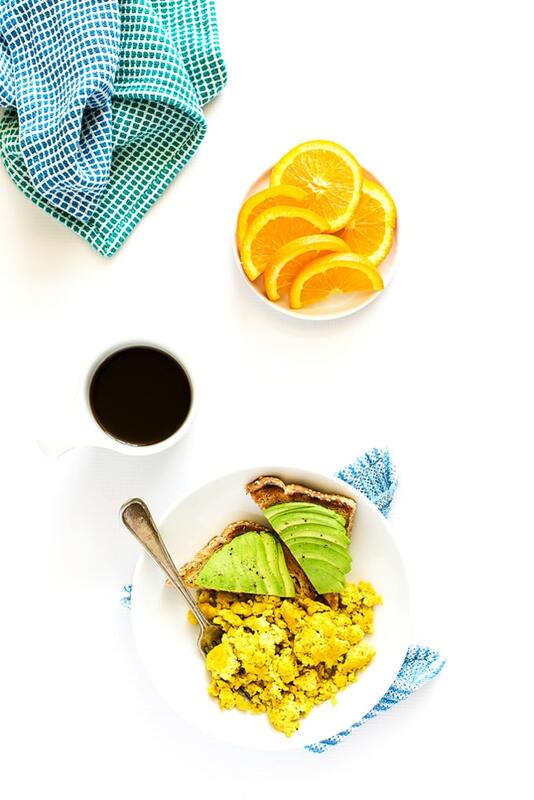 Then, plate your scrambled “eggs” alongside some avocado toast, coffee + maybe even a few orange slices and serve. Or if your taste buds are anything like mine, douse your scrambled eggs with ketchup before serving. Then, sink your fork in and do a little vegan-scrambled-egg shimmy right there in your kitchen. 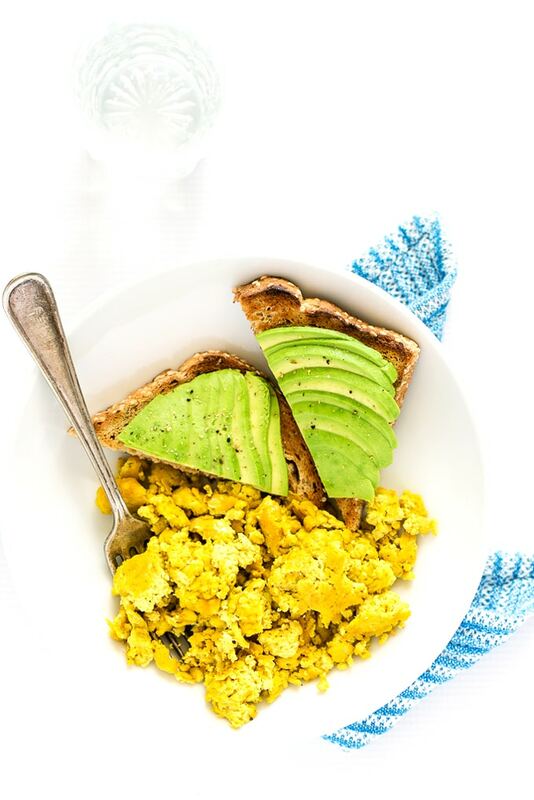 Vegan scrambled eggs that actually scramble thanks to a secret ingredient: aquafaba (aka chickpea brine). These vegan scrambled eggs are made with a combination of firm tofu, aquafaba, olive oil, nutritional yeast, kala namak (for an egg-like sulfuric taste), ground turmeric (for color), and freshly ground black pepper. 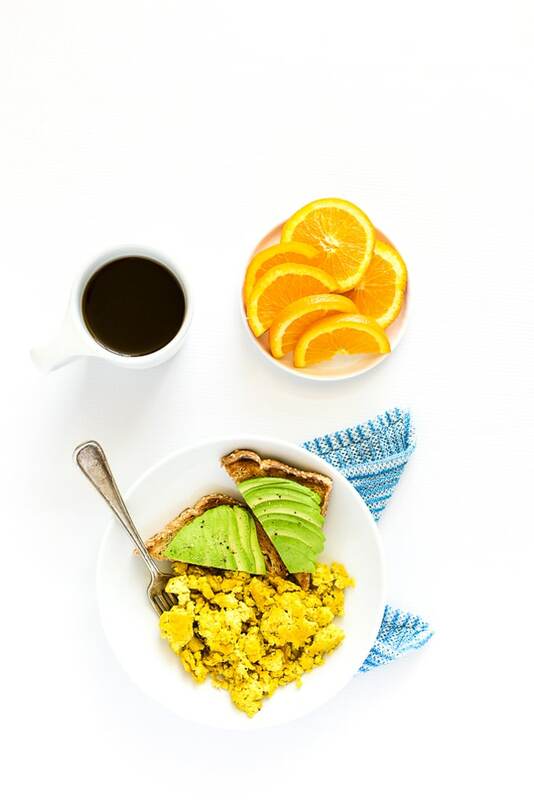 All ingredients get blended until smooth and then scrambled in a skillet just like traditional scrambled eggs. 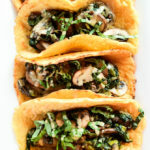 Serve them alongside avocado toast and orange slices for the perfect vegan brunch! 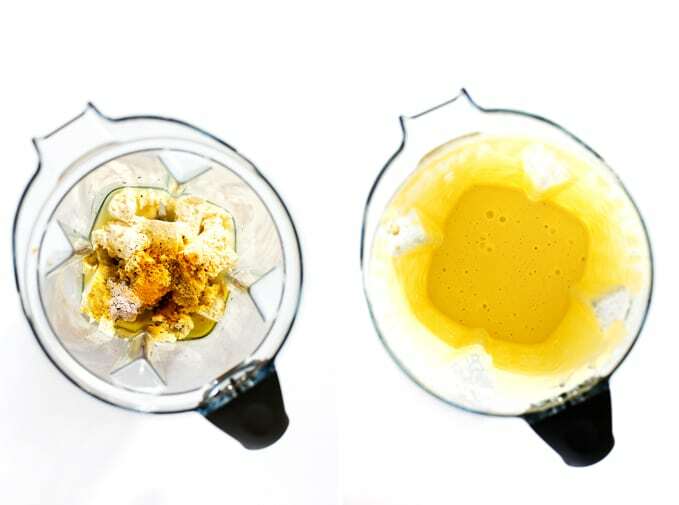 In a high-speed blender, combine the tofu, aquafaba, olive oil, nutritional yeast, kala namak, turmeric, and black pepper (if using). Blend on high for 1 minute or until completely smooth. Grease a large skillet and heat over medium heat. Once the pan is hot, add the blended tofu mixture (it will sputter when it hits the pan, so be careful). Cook for 1 minute and then immediately cover the pan and cook for another 2 to 3 minutes, or until the mixture begins to set around the edges but is still bubbling in the center. Remove the lid and use a wooden spoon or heat-safe spatula to gently pull the mixture across the pan, forming soft curds. Continue to cook for another 8 to 10 minutes, gently pulling and folding the "eggs" every minute or so until the mixture begins to separate into soft, fluffy small to medium-size curds. 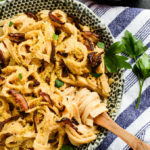 The mixture will appear "goopy" for the first several minutes, but just keep cooking until the "eggs" take on a soft-scrambled quality and the "goopiness" disappears. Do not stir the "eggs" constantly or you'll end up with scrambled bits and pieces. Remove from the heat and season to taste with more kala namak (I use an additional 1/8 teaspoon) and black pepper, if desired. Serve immediately. 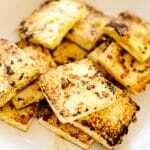 *Make sure you use firm tofu—extra-firm tofu does not work as well as it yields a slightly spongier texture. **Aquafaba is the canning liquid from chickpeas. To collect it, place a colander over a spouted mixing bowl and pour the contents of a 14-ounce can of chickpeas into it, separating the canning liquid from the chickpeas. Measure off 1/2 cup of the canning liquid and reserve the chickpeas for another use. ***Be careful not to confuse this with "black lava salt" as it is not the same and does not have the same "eggy" flavor needed for this recipe. I have never heard of aquafaba before! Great new recipe, thanks for sharing! The recipe is great but what is FANTASTIC are the dish clothes in the pictures. Could you share the source??? Thanks! Thank you! Hope you enjoy the recipe! I just tried this and it was AMAZING. My partner is a new vegetarian (not yet vegan), and he really does not like tofu scramble (although, who doesn’t like tofu scramble?! also, I make the best scramble, so he’s out of his mind). Anyway, the point is — I just made this for breakfast because I finally had both firm tofu & a can of chickpeas in my house at the same time and my partner and I gobbled it up. Soooo good. He even declared, “This is the best scrambled I’ve EVER had.” Apparently he meant including real-egg scrambles. Miranda, I’m blown away by this comment! I’m so glad you and your partner enjoyed them, and I’m honestly stunned that he declared them his favorite ever (including real scrambled eggs). I have to say, I felt proud of this recipe when I posted it but I did not anticipate that sort of awesome feedback. Thank you for taking the time to come back and share it! Hi again! Okay, so I continue to make this recipe non-stop and am loving it. (I switched to the “VeganEgg” product w/ algae for like a week but came back to your recipe because it is sooooo much more delicious and even the texture is better.) I do have an update, though, which is: The covering-the-tofu part is really important! My cast-iron pan didn’t have a lid for the longest time, so I covered the pan with an ill-fitting cookie sheet. I finally bought a real lid and it makes a HUGE difference in the fluffiness quality. So, to everyone who’s been skimping on the lid step — don’t! Thanks again for a great recipe, Ashley! I made this for my boyfriend and i for breakfast this morning. It does not yield two servings, though. More like 1.2. The flavor was okay, but it didn’t resemble scrambled eggs in consistency or flavor. But it could be because the aquafaba i used was slightly reduced. Hi, Whitney! I’m so glad you tried the recipe, but I’m so sorry it didn’t come out as expected! Let me see if I can problem solve a bit. . . Reduced aquafaba will cause a gummy texture (I know, because that was one of the many ways I tested the recipe), so that could have been the issue (at least texture-wise). Did you use kala namak/black salt (note: this is not the same as black lava salt)? It has a potent sulfur taste to it, which is what offers the scramble its eggy flavor. I hear you on the serving size. I should probably go ahead and change it to one serving, as I eat the entire thing myself, but I went with two because 6 ounces of tofu is actually two servings according to most packages. I’ll make a note on that. I hope some of this is useful and again, I’m so sorry it didn’t turn out as you expected! Thanks for the tips, Ashley! I will try not to leave aquafaba in the microwave unattended next time… ???? I was thawing it, and must’ve accidentally set the power to high, and it boiled over. A lot.. I will try to make it again; with proper aquafaba. That said, i don’t mind if my tofu scramble has a different consistency to eggs. I am having this for dinner right now. Turned out great. Thanks very much for the recipe. Hi Ashley, can’t wait to try this! Please clarify, are you using asceptic packed tofu or water packed tofu? Hi, Elizabeth! Water packed tofu (not silken or aseptic-packed). Hope you enjoy the recipe! A few years late to the show, but making this today. Did you press the tofu after draining? Also, any thoughts on doubling the recipe as far as cooking directions. Hi, Shellie! No need to press the tofu after draining. They’ll definitely require a bit more cooking time if you’re doubling the recipe but not sure on exact timing as I haven’t tried it myself. Can I make a batch to cook single portions throughout the week? Will it keep well in the fridge? I, too, was an egg girl before going vegan! I ate a minimum of 2 daily. I was procrastinating about writing a paper for class when I wondered if it was possible to make a scrambled egg from aquafaba since it behaves like egg whites. Lo and behold, it is possible! I don’t have the right type of tofu, so I’ll have to save this for another day, but thank you for this recipe! This turned out very good. I think I could have cooked it a little bit longer as the insides ended up being a little more moist than I expected. That being said the moisture didn’t take away from the taste that much, I especially thought the eggs tasted great on a piece of toasted sourdough with a little bit of salsa. Can you make an omelette with this recipe? Hi Maria! I can’t say for sure because I haven’t tested it that way but it’s possible it might work. Did you try the omelette? Made these this morning, really liked them. I increased the amount by half and still wasn’t enough to serve two people, will double it next time. Thanks for your feedback, Colleen! I tried this recipe this morning and my mixture didn’t really get out of the “goopy” stage. Does that mean I didn’t add enough tofu to the mixture? Any suggestions? Thanks! Hi, Lauren! Did you use firm tofu (not firm silken or softer types)? Also, did you weigh it to measure or did you eyeball it? I did use firm tofu. I did not weigh it though. I don’t have a scale so I had to eyeball it. Tried this today and it reminded me of cheese! In my case that was a happy accident since that’s one of the things I’ve missed since going plant based. Delicious! Thank you! Excellent! Thank you! Finally found the secret for goowy scramed tofu! Next time, I’ll lower the heat! Thanks for doing the leg (kitchen) work and sharing. I am definitely going to try your recipe. I know a good recipe when I read it. I have a question though. I was trying out aqua faba before and I put it in the fridge overnight, the next morning it had separated. What did I do wrong, could it be that I didn’t whip it enough? Thanks, Lillian! How did you handle the aquafaba/what type of recipe were you using it for? Un-whipped aquafaba won’t separate, but if you had whipped it and then refrigerated, it’s possible it could separate. Difficult to say without knowing specifics but it shouldn’t be a problem for this recipe since you’re adding it in a liquid state straight from the can. Hi, Rachel! No need to press the tofu. Just add and blend. Enjoy! Had some tofu that had to get used up… did a double recipe. Had to simmer it quite a bit longer, probably because I’m at altitude (~7800′). Ate it with 3 baked potatoes and some vegan bacon bits. Stupendous flavor! Texture is hard to do but I’ll make it again quite soon I’m sure, I might try a tiny bit of cornstarch to see what happens. I’m a large man, not fat any more but still large. Due to gallbladder issues I’ve had to give up eggs and almost all fat (vegan fat/oil isn’t that problematic). This reminded me of my good old piggy days and will help me put some weight back on…. sigh…. thank you!! Incredibly close to scrambled eggs flavor. So glad to hear you’re enjoying the recipe, John! Thanks for taking time out of your day to come back and share your thoughts, tips, etc. It really means so much and is very helpful for others, too! Happy cooking to you and cheers to your health! Delicious recipe. Timing was off because I doubled the recipe, but they came out perfectly.. We tried them rolled in tortillas. So good! I saved this recipe on Pinterest when I first started my journey to a vegan/plant-based lifestyle. I was nervous to make it and have a disaster because the instructions are really specific, but I finally tried it this morning. First, THANK YOU SO MUCH for making the instructions specific. I made this exactly to the recipe and it is *phenomenal*. Like, completely satisfied my need for that eggy breakfast I used to have before going plant based. 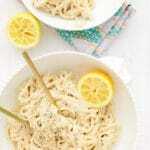 I cannot even describe how much I love this recipe! Second, to anyone considering trying this recipe: do it! And use all the listed ingredients and follow the instructions just as they are written. Don’t modify anything until you’ve at least tried the recipe as it is! Third, I am going to take a shot and add this to make ahead breakfast burritos that I’m freezing for the week. I will come back and let you know how it fares in this adaptation. Heather, your feedback warms my heart! So glad you’re enjoying the recipe so much. Thanks for taking time out of your weekend to come back and share your thoughts, rating, and tips—means so much. Happy cooking to you! p.s. LOVE the burrito idea! Will have to try it, too! Did you know there are at least 3 vegan cookbooks with aquafaba based recipes?? I don’t know which one to buy! I really respect your opinion so could your review the ones written by Rebecca Coleman, Zsu Dever, and Kelsey Kinser? Maybe post a comparison? Hi, Nulla! I’m not familiar with these cookbook authors, but if I ever do end up reviewing their cookbooks, I’ll be sure to let you know. Thank you so much for this recipe, I will be trying it out for sure! I do have a question, that I’m unable to find the answer for online, but I see you have a lot more knowledge about aquafaba, maybe you could help me. I was trying to make vegan quiche the other day, based on a similar recipe, using tofu and aquafaba etc. blending everything together in a blender. My problem is that I like to adjust the seasoning while I’m making the food, but when I tried this raw mixture… damn… the smell and the taste was just so bad I didn’t want to risk baking it. Is that a normal thing using aquafaba? Does the canned dogfood smell and taste go away during baking? Hi, Eni! You’re welcome for the recipe. It’s difficult to say whether or not the smell and taste will shift without having tried the recipe myself. As a general rule, I find that cooking and baking completely counteracts the beany smell and flavor of aquafaba; however, if you’re one of those “super tasters,” perhaps you’ll still be able to detect it. Just depends on your sensitivity and taste preferences. Hope this helps.